Left: Tina�s frostniped face. Right: Iranian medicine. 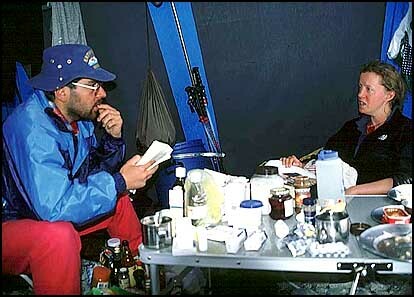 Medicine on Everest is simply a game of helping each other when needed, for you never know when it�s your turn be struck ill. That may mean being handed some strange Persian pills from the friendly Iran-expedition doctor, murmuring Allahuakbar, and swallowing with your fingers crossed. And later giving out what's left of your supplies to a brave Nepali nurse, running her small, lonely medical station somewhere on the Rhodoredron clad foothill of the mountains. Click on image to view large: Tina and Iranian climbing doctor. Click on image to view large: Tina�s facial edema. 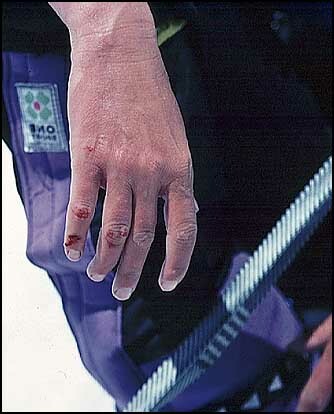 Click on image to view large: Tina�s sore hand, Icefall. 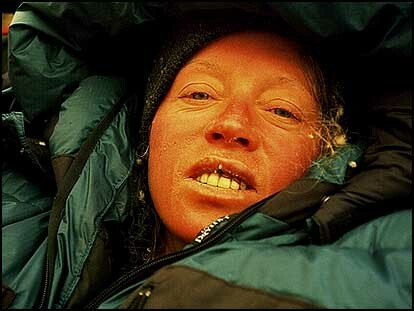 Altitude is hard on the stomach too and since human and yak extremities don�t fade in this climate, just a tiny, invisible peace of this stuff in your drinking water may rapidly transfer you from the mountain to a hospital. We bring a whole range of medical aids to cope with our endeavours. But the best thing to do is to take it slow whilst acclimatizing and - DRINK PLENTY. This is the best way to feel healthy on the mountain. We force down as much as 8 liters a day. Another good tip is to wear some kind of mask as protection against the cold, dry air. We wear masks made of steel wire threads that were invented for the Finnish Olympic ski team. To climb a high mountain means that you need to know what happens in your body at high altitude. Brain and lung edema is deadly and you might not even notice that you suffer from it. You might fall a sleep with a slight headache only to never wake again in the morning. 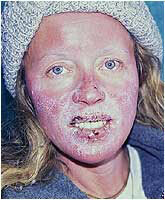 Hypothermia could set in in a sudden storm and kill you in half an hour. Frostbite doesn't show untill it's a fact. There are ways to prevent, cure and survive. But it requires that you study mountaneering medicine and climb smaller mountains gradually - preferably selfsufficiently (i.e. without guides) - to learn the name of the game. Only then will you be a dependable partner and be able to survive when the going gets tough.